Does the Jonah Williams Pick Prove the Bengals Trust Andy Dalton? The Mo Egger Blog: When You Like The Player, But Not The Pick. The Bengals addressed the offensive line in the first round. What will they do in the second? Jonah Williams talks during a press conference after being drafter first-round pick for the Cincinnati Bengals. The Steelers traded in front of the Bengals in the opening round of the 2019 NFL draft. Go inside the draft room and listen in to when Head Coach Zac Taylor and Offensive Line Coach Jim Turner called Jonah Williams to inform him he would be the 11th pick in the 2019 NFL Draft. Everyone on the Bengals’ offense will benefit from the arrival of Jonah Williams, sans the players he could be replacing. 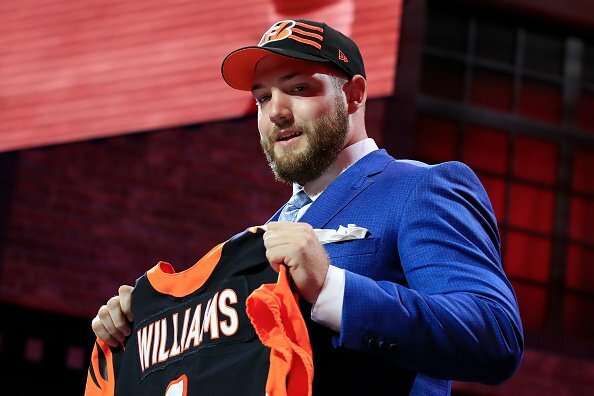 Bengals beat writers Fletcher Page and Paul Dehner Jr. break down the Cincinnati Bengals' first-round pick in offensive tackle Jonah Williams. Here are five factoids to know about the team’s new first-round pick. The Bengals believe there's a lot to like about Jonah Williams, from his flexibility to play multiple line positions to his character. 15 minutes with @Willie700WLW We covered #Reds, #Bengals, Asian Massage Parlors, UFO's, illegal immigration, Joey Votto and Joe Biden. Yep. Sounds about right. @JoeGoodberry Dave Lapham seems to think the pick could be Parris Campbell in round 2 if he’s there. What would you think about that pick? Personally I’m an Ohio State fan and I feel like that’s a bit rich for him. In each of the last two drafts, the #Bengals moved back in the second round to add a third or fourth-rounder. They then selected Joe Mixon & Jessie Bates. Considering wide range of quality options expected to be available have to think they'd entertain going 3 years in a row. I actually had Taylor 25th on the board to start. @JoeGoodberry since we took Jonah Williams at 11, my entire outlook on the draft changed. I’m kinda like you now BPA > Need. You surprised Jawaan Taylor dropped? I’d like to completely shock our OL. Take him or Cody Ford, or even go Greedy Williams if he’s still there. My rules for day 2 1) **** needs. There's great talent available. 2) If you didn't like them for round one, don't change your opinion because they "fell" to round two. @JoeGoodberry Based on how the draft went last night, who are you excited about as possible targets for them today? Polite would be interesting.